Alan's father, Abdullah Kurdi, and aunt, Tima Kurdi, attended the renaming ceremony held in Palma on Spain's Balearic Island of Mallorca. The event was organized by German charity Sea-Eye which operates the boat formerly known as the Professor Albrecht Penck. "We are happy that a German rescue ship will carry the name of our boy. My boy on the beach must never be forgotten. 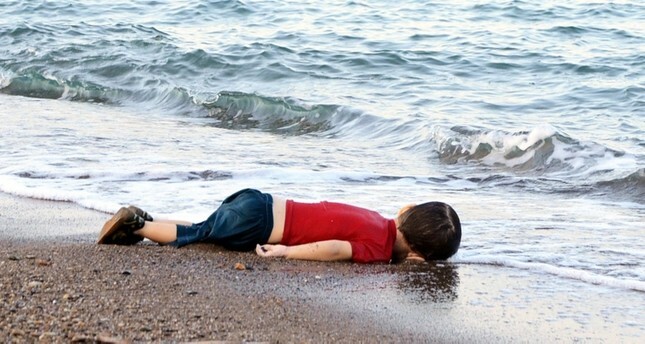 Our grief for the loss of my wife and sons is shared by many, by thousands of families who have so tragically lost sons and daughters this way," Abdullah Kurdi said in a statement released by Sea-Eye. Kurdi paid smugglers to take him and his family from Turkey to Greece after the Turkish government would not grant them the exit visas they needed to enter Canada where Tima lives as refugees. Their September 2015 journey across the Mediterranean ended in tragedy after the flimsy inflatable boat sank in rough seas. Eleven refugees died, including Kurdi's wife Rehanna and their two young boys, Ghalib and Alan — or Aylan as his name was widely transcribed in the anglophone press at the time. The images of Alan, wearing a red T-shirt, blue shorts and black shoes, and lying face-down in the surf, sparked outcry around the world and led to demands that more should be done to protect those making the perilous journey from North Africa to Europe. But the rise of anti-immigrant movements across Europe in response to the spike in arrivals in 2015 has seen governments seek to stem the numbers amid continuing rows over who should take those who do make it. Sea-Eye says it has saved more than 14,000 people from drowning in the Mediterranean in more than 60 missions since it started operating in 2016.